Station Hollywood: Happy birthday to superstar Salman Khan. Happy birthday to Salman Khan. The viewers of bollywood films wish happy birthday to Salman Khan on 27th December, 2017. He had been the other superstar other than Shahrukh Khan who had ruled bollywood films for the last 23 years. Although he had mixed results in respect of success of his films released in 2009 and 2008, his popularity and box-office had remained intact. 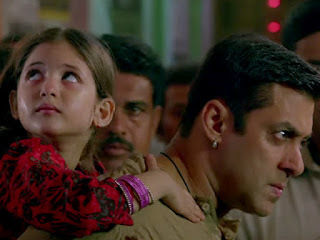 In 2010, he had given the greatest hit Dabanng, which had done business of more than Rs 150 crores. From that time he had proved himself as the greatest cash generator of bollywood films. His film Ready released in summer 2011 did business worth 125 crores and his film Bodyguard had broken the record of Dabanng and did business worth 160 crores. In 2012 his film Ek Tha Tiger had been the greatest grosser with business of 200 crores. His other film Dabaang 2 had already done business of more than 158 crores. In 2013 he did not act in any film. In 2014 his film Jai Ho did medium business with 115 crores. But his other film Kick became a blockbuster with business of 235 crores. His film Bajrangi Bhaijaan in 2015 did business worth Rs 320 crores. His other film Prem Ratan Dhan Payo on the first day of release itself did business of 40 crores. He created an impression before the viewers with his romantic film Maine Pyar Kiya in 1989. After that he had acted in every type of film including comedy films, action films etc. His musical blockbusters include Khamoshi with Manisha Koirala, Andaz Apna Apna with Amir Khan, Karishma Kapoor and Ravina Tandon, Jab Pyar Kisi Se Hota Hai opposite Twinkle Khanna, Har Dil Jo Pyar Karega opposite Preeti Zinta, to name a few. He build a manly body from the early part of his career and from that time became the role model of many youngstars of the country. His action films included Auzaar with Shilpa Shetty, Tumko Na Bhool Payenge with Diya Mirza, Tere Naam, Karan Arjun opposite Mamta Kulkarni, to name a few. His recent action film in 2009 titled Wanted opposite Ayesha Takia did brilliant business. Although he did not shape his career as an action hero like Sunny Deol or Sanjay Dutt, his performance in action films were very impressive. He acted in landmark comedy films during his career, which included Maine Pyar Kyun Kiya opposite Katrina Kaif and Sushmita Sen, Mujhse Shaadi Karoge opposite Priyanka Chopra, Partner opposite Lara Dutta, God Tussi Great Ho opposite Priyanka Chopra, to name a few. In 2009, he acted in romantic films Mai Aur Mrs Khanna, opposite Kareena Kapoor, and also London Dreams with Ajay Devgan and Asin. Although Mai Aur Mrs. Khanna did average business, London Dreams became hit. If his films in 2008 can be analyzed it can be said that his film Heroes with Sunny Deol, Bobby Deol and Preeti Zinta, had done best business so far. The films God Tussi Great Ho did average business and the film Yuvvraaj could not rise up to the hype that was created by strong promotion of Subhash Ghai. Salman Khan and Katrina Kaif’s performance had been well appreciated by the film-lovers and the film had created aesthetic values with innovative music and good locations. In 2010 his film Veer has both romantic elements and action elements as well but the huge cost that was put up was not recovered at all. His television show Dus Ka Dum in Sony Channel got fantastic response in 2009. The leading actors of bollywood films including Akshay Kumar, Priyanka Chopra, Katrina Kaif, Jeetender, Tusshar Kapoor, Amir Khan, Ranbir Kapoor, Deepika Padukone, all appeared in that show and Salman Khan helped all of them for the promotion of their films that were released this year. In 2011 his show Big Boss got excellent viewership with Sanjay Dutt also sharing the role of anchoring. Salman Khan had been extremely popular for the viewers of TV Channels for his straight forward communications. He appeared in Saregamapa Music Competition in Zee TV with Katrina Kaif and asked Aditya Narayan, Himesh Reshammiya, Pritam, Shankar Mahadevan and others about the fate of Aneek, Raja and others who had won the competition before. He enquired whether they had got chance in bollywood films or whether they were still struggling. No other bollywood actor would have ever been concerned about the fate of upcoming talents including singers, dancers, actors, etc. In 2011 he came during Zee Saregamapa Little Champs program and encouraged child participants like Azmat Hussain, Niladri Chatterjee, Salman Ali, Nitin Kumar, and others. In 2012 and 2013 he did a great job in the TV Program Big Boss. The viewers expect him to break records after records as it is proved in the recent 3 years that he is the greatest crowdpuller in the country. Salman Khan had always been involved with controversies and his good deeds got neutralized due to the killing of deers in Jodhpur, offense relating to rash and negligent driving, etc. But those who had behaved well with Salman Khan know that he is a gem of a human being. 2010 had been a year with mixed fortunes for Salman Khan. While Veer did mediocre business, Dabanng ended up being blockbuster. He had also hosted the show Big Boss with huge success. 2011 had been excellent for Salman Khan with 2 of his films Ready and Bodyguard giving business of more than 125 crores each. The viewers expect Salman Khan to give an even better performance in the film Dabaang 3 opposite Sonakshi Sinha which are going to be made in future.